Ladies eye mask with satin back and elasticated headband. 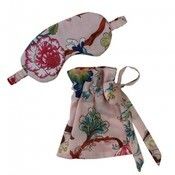 All eye masks come in a matching fabric bag with drawstring tie. One size.